Le Creuset's latest line of stoneware is a contemporary expression of French character that features improved performance. 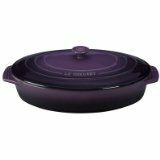 The updated design emphasizes our signature triple-ring detailing, making this range a lovely complement to other Le Creuset products. Each piece has been thoughtfully considered to deliver a perfect cooking and baking experience every time.